Oh, to be a stranded astronaut on the surface of the planet Mars this week. There’s a great scene from Andy Weir’s recent novel The Martian where chief protagonist Mark Watney uses the swift moving moons of Phobos and Deimos to roughly gauge his direction while travelling across the expansive Martian desert. This week, the skies over Mars will also be graced by an unforgettable and spectacular sight: the extremely close passage of Comet C/2013 A1 Siding Spring. The first comet discovered in 2013, A1 Siding Spring was spotted by veteran comet hunter Robert McNaught from the Siding Spring Observatory in Australia. Dozens of comets are discovered in any given year, but this one soon gained the attention of astronomers when it was found that the comet could possibly hit Mars in October 2014. And although further observations refined A1 Siding Spring’s orbit and ruled out such an impact, the particulars of the close passage of the comet past Mars are still stunning: A1 Siding Spring will pass within 87,000 miles (139,500 kilometres) from the center of Mars on Sunday, October 19th at 18:27 Universal Time (UT) or 2:27 PM EDT. And although we’ve yet to set “boots” on Mars, a fleet of spacecraft arrayed throughout the inner solar system are set to study the comet from both near and far. NASA has taken measures to assure that spacecraft in orbit are afforded maximum protection from incoming cometary debris, and the exciting possibility exists that we’ll be able to study first-hand the interaction of the comet’s tail with the Martian atmosphere. 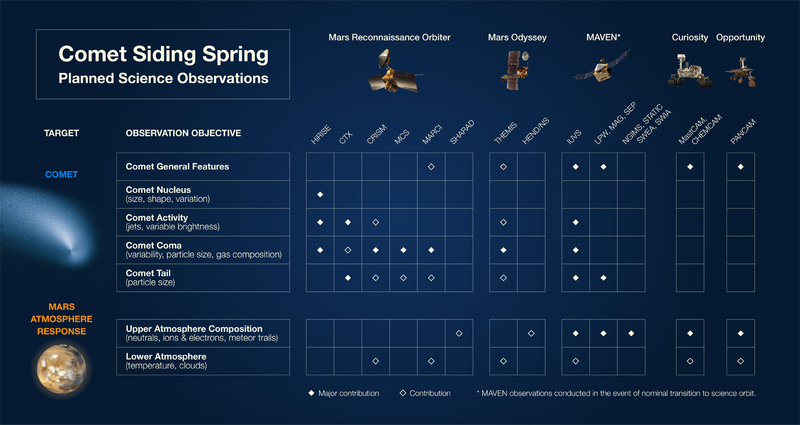 Mars-based spacecraft set to observe Comet A1 Siding Spring: a scorecard. Credit: NASA. Universe Today has written extensively on the scientific efforts to study the event, how to observe the comet from Earth, and the unprecedented amateur and professional campaign in progress to witness the close pass. What we’d like to do now is imagine the unparalleled view under alien skies as the comet slides gracefully overhead. The nucleus of A1 Siding Spring is thought to be 700 metres across, and the coma extends 19,300 km in diameter. The comet’s closest passage is just under six times the distance of Mars’ outer moon Deimos, and at closest approach, the coma will appear almost 8 degrees in size to any would-be Martian — that’s 16 times the diameter of a Full Moon as seen from the Earth — and will be crossing the skies at a staggering 1.5 degrees a minute. You would be able to easily see the motion of the comet as it moves across the Martian sky with the unaided (well, space suit helmet protected) eye after just a few dozen seconds worth of watching! The comet’s magnitude may reach -5 as seen from Mars, though that would also be extended over its huge expanded surface area. There’s also been some discussion as of late that A1 Siding Spring has slowed down in terms of its predicted brightening, though this is not unusual or unexpected. From Acidalia Planitia (the setting for The Martian) located in the mid-northern latitudes on the surface of Mars, the comet would be a fine morning object, sitting 48 degrees above the northeastern horizon at dawn at closest passage for one morning only, and perhaps staying visible even after sunrise. Earth would be in the picture too, shining at magnitude -2.5 in the Martian dawn. Dawn on October 19th, 2014, as seen from Mars. Created using Starry Night. And the view from the comet? Now that would be a truly spectacular ride, as Mars swells to 3 degrees in diameter as it approaches and recedes. The comet itself is on a million year plus orbit, never to again visit the realm of the inner solar system in our lifetimes. Such a view has never been seen in recorded history from the Earth. The closest confirmed passage of a large comet near our planet was Comet D/1770 L1 Lexell, which passed over 15 times more distant than A1 Siding Spring from Mars, at 2.2 million km from Earth on July 1st, 1770. Note that an even closer cometary passage in 1491 remains unverified. In more recent times, Comet Hyakutake passed 15.8 million km from Earth on March 25th, 1996, with a tail that spanned half the sky as seen from a dark sky site, and long-time comet observers might also remember the 1983 passage of Comet IRAS-Araki-Alcock, which passed just 4.7 million kilometres from the Earth. A1 Siding Spring imaged from Earth on October 11th, 2014. Credit: Efrain Morales Rivera. And then there was the historic impact on Comet Shoemaker-Levy 9 into Jupiter in 1994, reminding us that cosmic catastrophes can and do indeed occur… the upper size limit estimate for the nucleus of A1 Siding Spring compares to 70% the size of Fragment G, and an impact on Earth or Mars of such a dirty snowball would be a very bad day, for rovers or the humans. An extinction level event such as the Chicxulub impactor, however, was estimated to be much larger, at about 10 km in size. A1 Siding Springs as imaged on September 3rd, 2014. Credit: Roger Hutchinson. Thankfully, we’ve merely got a front row seat to the show this weekend, and our planet is not the main event. From Earth, Comet A1 Siding Spring will be a binocular object, shining at magnitude +9 as it passes 3’ from +0.9 magnitude Mars. Both will be visible briefly in dusk skies, and the Virtual Telescope Project also plans to broadcast the event live starting at 16:45 UT on October 19th. 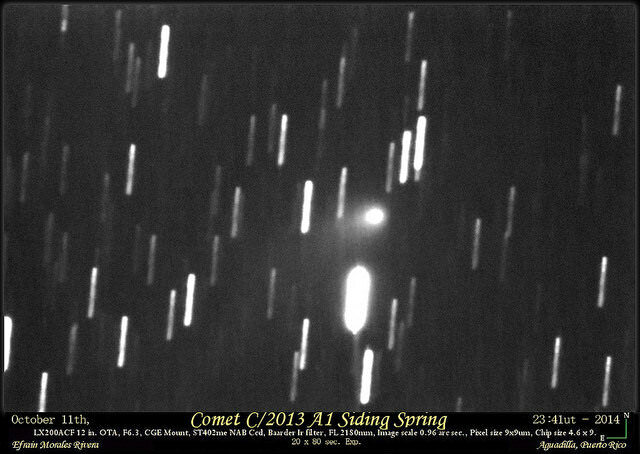 Don’t miss the historic passage of Comet A1 Siding Spring past Mars… by this time next week, we fully expect more images of the comet — both amateur and professional — to grace the cyber-pages of Universe Today! Imaging A1 Siding Spring and/or Mars? Send those astro-pics into Universe Today at our Flickr forum.